This is a technical post, so Julian Assange fans can tune out. I’m actually writing about source code management for Vensim models. Occasionally procurements try to treat model development like software development. That can end in tragedy, because modeling isn’t the same as coding. However, there are many common attributes, and therefore software tools can be useful for modeling. One typical challenge in model development is version control. Model development is iterative, and I typically go through fifty or more named model versions in the course of a project. C-ROADS is at v142 of its second life. It takes discipline to keep track of all those model iterations, especially if you’d like to be able to document changes along the way and recover old versions. Having a distributed team adds to the challenge. Another TED talk argues for replacing calculus with statistics at the pinnacle of mathematics education. There’s an interesting discussion at Wild About Math!. I’m a bit wary of the idea. First, I don’t think there needs to be a pinnacle – math can be a Bactrian camel. Second, some of the concepts are commingled anyway (limits and convergence, for example), so it hardly makes sense to treat them as competitors. Third, both are hugely important to good decision making (which is ultimately what we want out of education). Fourth, the world is a dynamic, stochastic system, so you need to understand a little of each. Where the real opportunity lies, I think, is in motivating the teaching of both experientially. Start calculus with stocks and flows and physical systems, and start statistics with games of chance and estimation. Use both to help people learn how to make better inferences about a complex world. Then do the math as it gets interesting and necessary. Whether you come at the problem from the angle of dynamics or uncertainty first hardly matters. Author TomPosted on December 10, 2010 Categories Education, SystemDynamicsTags calculus, mathematics, statistics6 Comments on Statistics >> Calculus ? Env-Econ is one of several econ sites to pick up on standupeconomist Yoram Bauman’s assessment, Grading Economics Textbooks on Climate Change. Overall, the book is not too bad if you ignore that it’s based on climate science that is almost 15 years out of date and that it has multiple errors that would make Wikipedia blush. The fact that this textbook has over 20 percent of the market shakes my faith in capitalism. The earth’s climate is driven by solar radiation. The energy the sun absorbs must be balanced by outgoing radiation from the earth and the atmosphere. Scientists fear that a flow imbalance is developing. Of particular concern is a buildup of carbon dioxide (CO2) that might trap heat in the earth’s atmosphere, warming the planet. The natural release of CO2 dwarfs the emissions from human activities. But there’s a concern that the steady increase in man-made CO2 emissions—principally from burning fossil fuels like gasoline and coal—is tipping the balance…. That’s quite a different situation. If an author can’t paint an accurate verbal picture of a simple stock-flow system like this, how can a text help students learn to manage resources, money or other stocks? 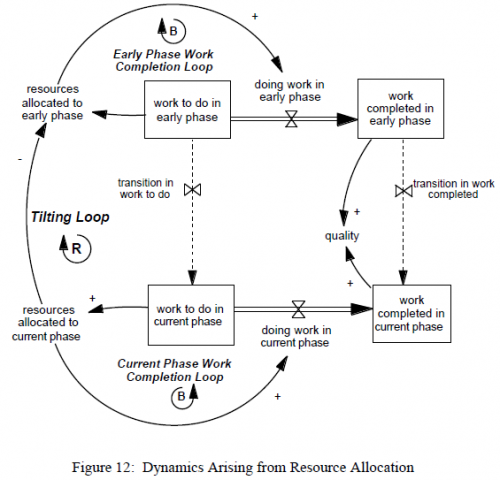 Rework – the rework cycle is central to project dynamics. Rework arises when things aren’t done right the first time. When errors are discovered, tasks have to be reworked, and there’s no guarantee that they’ll be done right the second time either. This creates a reinforcing loop that bloats project tasks beyond what’s expected with perfect execution. Rookie effects: new resources take time to get up to speed. Until they do, they eat up the time of senior staff, decreasing output. 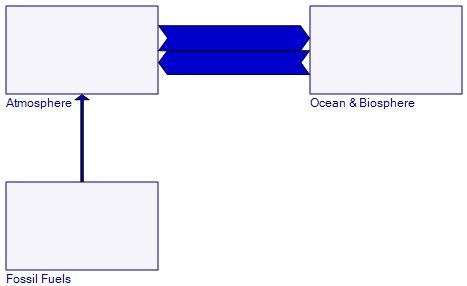 Also, they’re likely to be more error prone, creating more rework to be dealt with downstream. Diseconomies of scale from communication overhead. Burnout – under schedule pressure, it’s tempting to work harder and longer. That works briefly, but sustained overtime is likely to be counterproductive, due to decreases in productivity, turnover, and increases in error rates. Congestion – in construction or assembly, a delay in early phases may not delay the arrival of materials from suppliers. Unused materials stack up, congesting the work site and slowing progress further. Dilution – trying to overcome stalled phases by tackling too many tasks in parallel thins resources to the point that overhead consumes all available time, and progress grinds to a halt. Hopelessness – death marches are no fun, and the mere fact that a project is going astray hurts morale, leading to decreased productivity and loss of resources as rats leave the sinking ship. Any number of things can contribute to schedule pressure that triggers these traps. Often the trigger is external, such as late-breaking change orders or regulatory mandates. However, it can also arise internally through scope creep. As long as it appears that a project is on schedule (a supposition that’s likely to prove false in hindsight), it’s hard to resist additional feature requests and suppress gold-plating urges of developers. Taylor & Ford integrate a number of these dynamics into a simple model of single-project tipping points. They generically characterize the “ripple effect” via a few parameters: one characterizes “the amount of impact that reworked portions of the project have on the total work required to complete the project” and another captures the effect of schedule pressure on generation of rework. 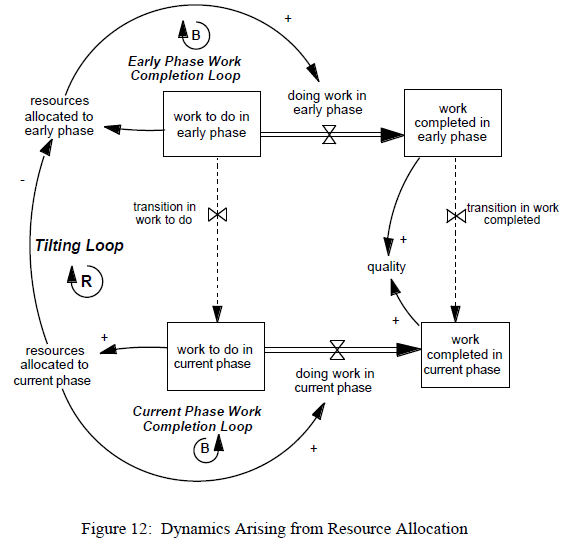 They suggest a robust design approach that keeps projects out of trouble, by ensuring that the vicious cycles created by these loops do not become dominant. … allowing managers to “save” troubled projects, and therefore receive accolades and benefits, creates a situation in which, for those interested in advancement, there is little incentive to execute a project properly from start to finish. While allowing such heroics may help in the short run, the long run health of the development system is better served by not rewarding them. … much of the complexity of concurrent development—and the implementation failures that plague many organizations—arises from interactions between the technical and behavioral dimensions. We use a dynamic project model that explicitly represents these interactions to investigate how a ‘‘Liar’s Club’’—concealing known rework requirements from managers and colleagues—can aggravate the ‘‘90% syndrome,’’ a common form of schedule failure, and disproportionately degrade schedule performance and project quality. Once caught in a downward spiral, managers must make some attribution of cause. The psychology literature also contains ample evidence suggesting that managers are more likely to attribute the cause of low performance to the attitudes and dispositions of people working within the process rather than to the structure of the process itself …. Thus, as performance begins to decline due to the downward spiral of fire fighting, managers are not only unlikely to learn to manage the system better, they are also likely to blame participants in the process. To make matters even worse, the system provides little evidence to discredit this hypothesis. Once fire fighting starts, system performance continues to decline even if the workload returns to its initial level. Further, managers will observe engineers spending a decreasing fraction of their time on up-front activities like concept development, providing powerful evidence confirming the managers’ mistaken belief that engineers are to blame for the declining performance. Finally, having blamed the cause of low performance on those who work within the process, what actions do managers then take? Two are likely. First, managers may be tempted to increase their control over the process via additional surveillance, more detailed reporting requirements, and increasingly bureaucratic procedures. Second, managers may increase the demands on the development process in the hope of forcing the staff to be more efficient. The insidious feature of these actions is that each amounts to increasing resource utilization and makes the system more prone to the downward spiral. Thus, if managers incorrectly attribute the cause of low performance, the actions they take both confirm their faulty attribution and make the situation worse rather than better. The end result of this dynamic is a management team that becomes increasingly frustrated with an engineering staff that they perceive as lazy, undisciplined, and unwilling to follow a pre-specified development process, and an engineering staff that becomes increasingly frustrated with managers that they feel do not understand the realities of the system and, consequently, set unachievable objectives. There’s a long history of the use of SD models to solve these problems, or to resolve conflicts over attribution after the fact. Whenever a student wandered in late to a lecture at MIT, Jim Hines would announce, “… and that’s the secret to system dynamics.” If you were one of those perpetually late students, who’s struggled without the secret ever since, I will now reveal it. ”The key to successful modeling is to keep one’s understanding of the model and what it says about the problem ahead of its size.” – Geoff Coyle, via JJ Lauble at the Vensim forum. Says McNew, putting on his systems thinking hat, “You think you’re going to get a one-to-one ratio of effort-to-result but you don’t. There’s no linear correlation. The project you’re firefighting isn’t helped as much as you think it will be, and the other project falls farther behind as it’s operating with fewer resources. In other words, you’ve doubled the dysfunction. … we add to insights already developed in single-project models about insufficient resource allocation and the “firefighting” and last-minute rework that often result by asking why dysfunctional resource allocation persists from project to project. …. The main insight of the analysis is that under-allocating resources to the early phases of a given project in a multi-project environment can create a vicious cycle of increasing error rates, overworked engineers, and declining performance in all future projects. Policy analysis begins with those that were under consideration by the organization described in our data set. Those policies turn out to offer relatively low leverage in offsetting the problem. We then test a sequence of new policies, each designed to reveal a different feature of the system’s structure and conclude with a strategy that we believe can significantly offset the dysfunctional dynamics we discuss. …. The positive feedback of tilting creates a trap that can snare incautious organizations. In the presence of such traps, well-intentioned policies can turn vicious. … testing plays a paradoxical role in multi-project development environments. On the one hand, it is absolutely necessary to preserve the integrity of the final product. On the other hand, in an environment where resources are scarce, allocating additional resources to testing or to addressing the problems that testing identifies leaves fewer resources available to do the up-front work that prevents problems in the first place in subsequent projects. Thus, while a decision to increase the amount of testing can yield higher quality in the short run, it can also ignite a cycle of greater-than-expected resource requirements for projects in downstream phases, fewer resources allocated to early upstream phases, and increasingly delayed discovery of major problems. In contrast, however, consider another example. Imagine this time that the organization starts to the left of the solid black dot and accomplishes only 40 percent of its planned concept development activities. Now, reading up and over, shows that instead of completing more early phase work in the next year, the organization completes less—in this case only about 25 percent. In subsequent years, the completion fraction declines further, creating a vicious cycle of declining attention to upfront activities and increasing error rates in design work. 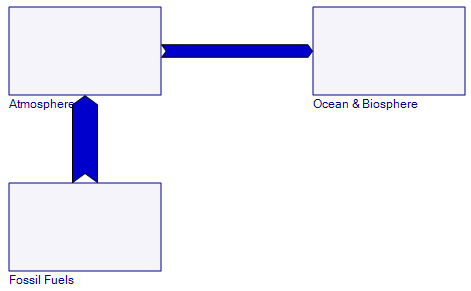 In this case, the system converges to a mode in which concept development work is ignored in favor of fixing problems in the downstream project. The phase plot thus reveals two important features of the system. First, note from the discussion above that anytime the plot crosses the forty-five degree line … the execution mode in question will repeat itself. Formally, at these points the system is said to be in equilibrium. Practically, equilibria represent the possible “steady states” in the system, the execution modes that, once reached, are self-sustaining. As the plot highlights, this system has three equilibria (highlighted by the solid black circles), two at the corners and one in the center of the diagram. Formally, the unstable equilibrium represents the boundary between two basins of attraction. …. This boundary, or tipping point, plays a critical role in determining the system’s behavior because it is the point at which the positive loop changes direction. 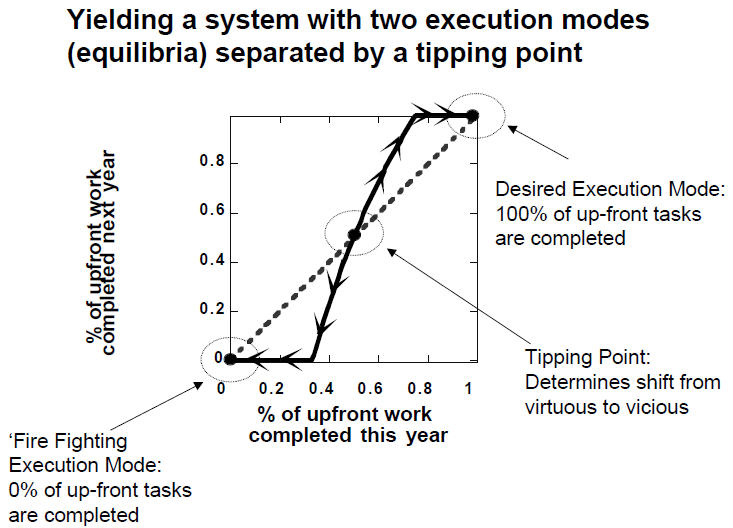 If the system starts in the desirable execution mode and then is perturbed, if the shock is large enough to push the system over the tipping point, it does not return to its initial equilibrium and desired execution mode. Instead, the system follows a new downward trajectory and eventually becomes trapped in the fire fighting equilibrium. You’ll have to read the papers to get the interesting prescriptions for improvement, plus some additional dynamics of manager perceptions that accentuate the trap. Stay tuned for a part II on this topic.